After having a central catheter inserted in their arm, some patients are told that their best option for covering and protecting the insertion site is a cut-off tube sock. Peripherally inserted central catheters, called PICC lines, are typically inserted in a vein in the patient’s arm to provide intravenous treatments like chemotherapy or extended antibiotic therapy and are often in place for several weeks or months. Walking around with a tube sock on your arm for that long is not exactly an appealing option, but leaving the site uncovered could cause infections or other problems. After seeing several friends and family members go through chemotherapy – complete with tube socks on their arms – University of Virginia alumnus Chaitenya Razdan thought there had to be a better way. 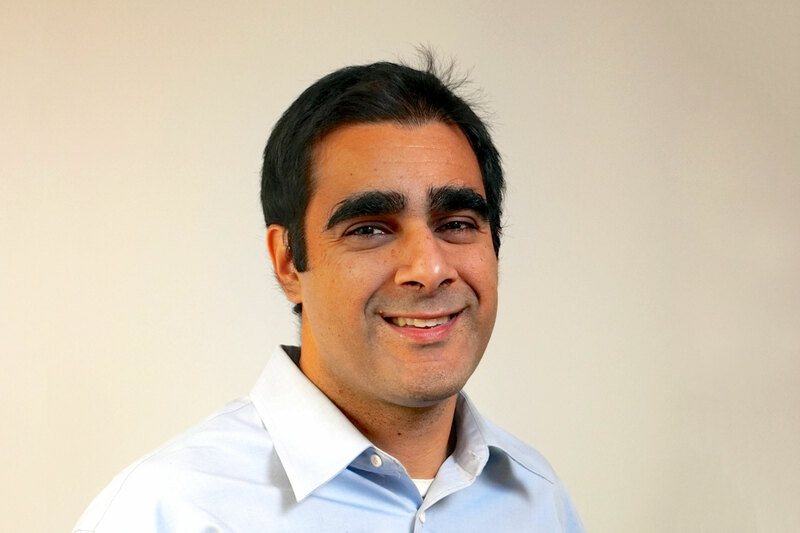 “Technology is evolving all around us – we now have self-driving cars, for example – but not a lot has changed in the products that people wear when they are dealing with a chronic health condition,” said Razdan, who graduated from UVA’s McIntire School of Commerce in 2005 and went on to work in banking and consulting. He reached out to a friend in the fashion business, Susan Jones, and in 2014 the two of them co-founded Care+Wear. The first product they created was an antimicrobial PICC line cover, a soft, breathable sleeve that keeps the PICC line in place, helps deter infection and includes a patented mesh window where patients, nurses and doctors can easily check on the site. The sleeves come in several colors and can even be customized with team logos. In addition to consulting with patients, Razdan and his team worked with doctors and nurses – including advisers in the UVA Health System – to ensure that their products account for key medical concerns. UVA has already placed an order for customized PICC line covers that will be offered to patients, Razdan said. Care+Wear also offers specially designed shirts that accommodate and provide easy access to chest ports, another common method of delivering chemotherapy. 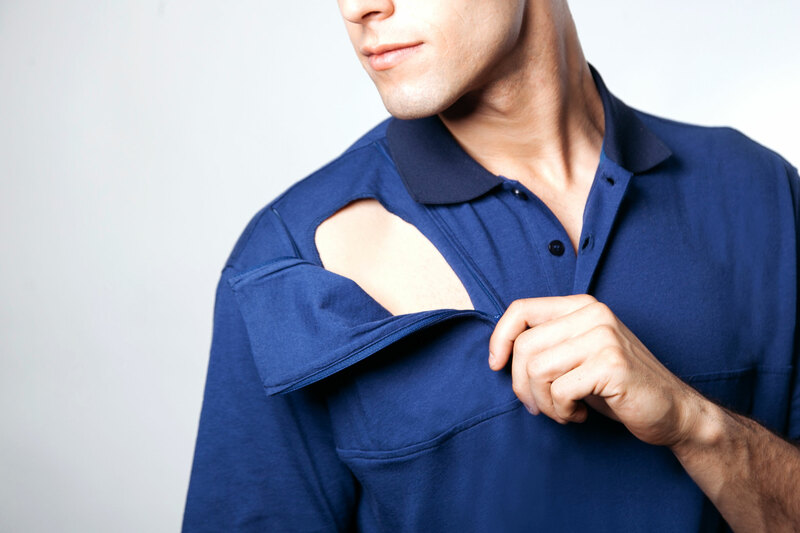 The women’s shirt includes a short zipper on one shoulder, while the men’s polo shirt has a small zippered panel that can be undone to access the port. For patients dealing with a chronic illness, regaining that sense of normalcy can be a tremendous relief. Care+Wear clients report that the shirts and PICC line covers have helped them attend classes without disruption or self-consciousness, travel without worrying about infection and enjoy special occasions like prom without having to wear a tube sock on their arm. One patient even reported wearing the sleeve while running a race. Currently, Razdan and his team are partnering with the Parsons School of Design to develop several new products. One designer, Lucy Jones, had already created an award-winning clothing line specifically designed for people in wheelchairs and is now working with Care+Wear to create specialized gloves for wheelchair users. The company is also designing pants for elderly patients and is even working with Parsons students to brainstorm new designs for the ubiquitous hospital gown, which patients of all ages have long lamented as flimsy and uncomfortable. Those new ideas, combined with the company’s current success, have attracted backers in both the health care and fashion industries. For Razdan, it all points to a coming boom in what he calls “the healthwear industry,” centered on designing products that can be used in conjunction with medical treatments to make a direct, positive impact on patients’ quality of life. Now, he and his team know that their products offer patients an immediate improvement.